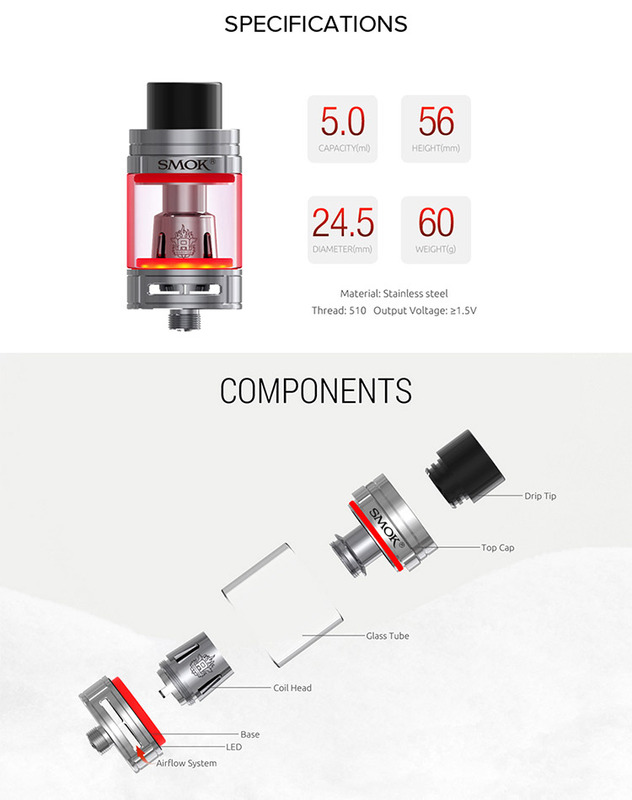 SMOK TFV8 Big Baby Light Edition tank 5ml, is an advanced version of TFV8 Big Baby, just as the name implies, this new version has LED lights at the base of the tank. When you fire the device to vape, the LED will light up and change its color along with the color of sealing ring. Besides, it can perfectly match with V8 Baby-X4, V8 Baby-T6, V8 Baby RBA, V8 Baby-Q2 and V8 Baby-T8 core. With bright light, hyper engines and large e-juice capacity, this baby gonna surprise you! 5. Delrin drip tip will bring increased airflow and provide you with powerful draw effects.